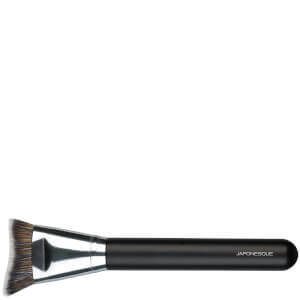 Achieve a flawless makeup base with the Straight Foundation Brush from Japonesque. Fitted with ultra-soft synthetic bristles, the must-have tool expertly buffs product into skin for full coverage, natural-looking colour that hides imperfections. Seamlessly distributing and blending foundation, simply use the flat surface on larger areas of the face, and the corner points to reach the eye and nose contours. Create a photo-ready complexion with ultimate control and professional results. Aplique a base com a superfície plana do pincel e use os cantos exteriores para alcançar as zonas mais estreitas do rosto.